An urban aesthetic characterizes Lacy's art, featured in the 1989 traveling exhibition, �Black Art-Ancestral Legacy: The African Impulse in African American Art.� Lacy's works, primarily in collage and mixed media, capture the pulse and plight of black life in urban America. In her 1986 work, "Welcome to My Ghetto Land,� (which hangs in the Dallas Museum of Art), Lacy pictures a tenement faced on a gold leaf adorned, Byzantine-styled icon. In another work, �Little Egypt Condo, New York City,� a luxury apartment front teams with Egyptian. Figures interacting under the watchful eyes of ancestral spirits. Lacy's love for the city goes back to her roots. Born in Washington, D.C., in 1932, Lacy grew up in the heart of black academia - her father worked at Howard University. She studied art as a high school student and later attended Southern University in Baton Rouge. There, she absorbed the multi-layered culture of the state, its African, French and Cajun influences, and incorporated them into her artistic ideal. Later when she married and moved to Los Angeles in the early 1960s, she found herself surrounded by a supportive community of black artists including the likes of Charles White and Betty Saar, whose works reflected the changing mood of the nation. Lacy attended the 1963 March on Washing- ton and the 1968 Poor People's March under the aegis of the Council of Churches of Los Angeles, for which her husband served as minister. 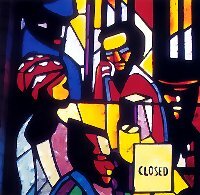 The Methodist Church of Southern California-Arizona Conference also engaged Lacy to design and illustrate a curriculum piece incorporating black history and Old Testament stories to be used as a teaching tool for black children in inner-city churches. Lacy's husband at the time, Rev. Nathaniel L. Lacy, Jr., wrote the accompanying text. For Lacy, life changed dramatically in the late 1960s. The couple moved to Dallas, eventually divorced, and Lacy supported herself and a young son by teaching art in the Dallas public schools. After more than a decade of teaching, she retired to become a full-time artist, and now her works hang in museums nationwide. The influences of black life in Washington, Louisiana and Los Angeles shaped Lacy's still-evolving style, marked by a strong depiction of the immediacy of contemporary black life and the urban dilemma, with a subtext of ancient African spirituality, culture and mystic lore. The St. Luke windows project, challenging viewers to consider an alternative to European biblical tradition, is Lacy's boldest statement to date. �We may not know what color Jesus was,� said Lacy, �but we know he was not Errol Flynn with blue eyes.� While Lacy's intent is to challenge, she also hopes the windows will teach.